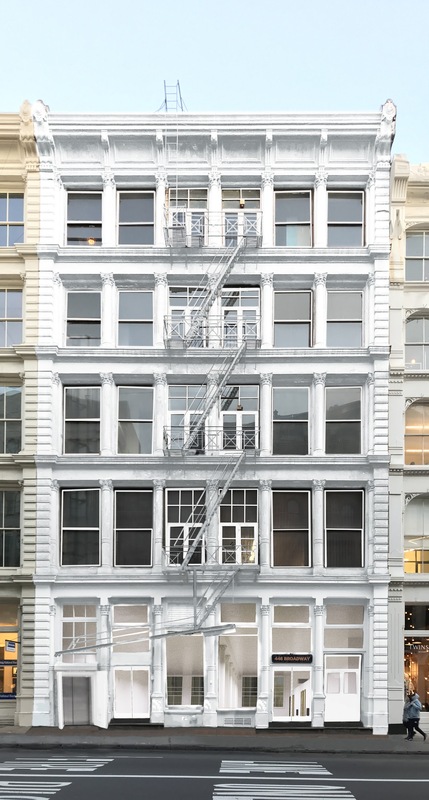 NEW YORK, August 20, 2018 – K Property Group (“KPG”) has purchased 446 Broadway, a five-story circa 1915 commercial building between Grand and Howard Street. Plans for the property include a major high-end renovation. When completed there will be approximately 26,000 square feet of office space and 5,250 square feet on the ground floor and 5,500 square feet on the lower level. The office space will consist of luxury full-floor pre-built units on the second, third and fourth floors; and a 5th floor one of a kind Penthouse with roof access and several large skylights. “This is now a premium office and retail location in New York’s hippest neighborhood of SOHO. Howard and Grand Streets are now the IT streets,” points out Gregory Kraut, Managing Partner, KPG. “Everything we’ve planned for the building is in line with the new look and feel of the area, while interiors are transformed into a high-end bespoke product that complements the rapidly changing landscape of lower SoHo “high-fashion brands that thrive on the street,” Kraut further stated. “This area has a dynamic that reflects Soho in the ‘90s. Its why people travel here for pictures to capture a little bit of edge and a hell of a lot of styles. We are excited to tap into that energy and further enhance our ‘lifestyle’ real estate product line,” said Rod Kritsberg, Founder and Managing Principal of KPG. Currently vacant, this is a unique opportunity for several retail and office tenants. The building has excellent physical characteristics of high ceilings and fantastic natural light thanks to oversized bay windows and lots of natural light. This historic location is surrounded by a host of high-fashion brands, as well as many of Manhattan’s most exclusive downtown lounges, hotels, and restaurants. Neighboring businesses include Roman and Williams Guild, Agnès B, Opening Ceremony, Nike Lab, Sleepy Jones, Stadium Goods and the 11 Howard Street Hotel. The property is also close to public transportation, including the number 6, R, and W subway lines, making it exceptionally accessible for office and retail businesses. As part of the development plan, the new ownership will market the space to a variety of potential tenants. “If you know the market, you know that Soho has been trending south and east from a tenancy perspective. This location has become one of the most desirable areas in lower SOHO,” Kraut said. The available office spaces will be approximately 6,500 square feet. Also, the ground level has 20-foot ceiling heights and about 50 feet of frontage which can easily be divided. Each of the upper-level floors, from second to fifth, have 12 bay windows and high ceilings. When construction is completed, individual floor plates will contain 6,500 rentable square feet, considered a rarity in Soho. K Property Group (“KPG”) is a fully-integrated real estate investment platform with asset management, leasing, and construction management capabilities. With more than 35 years of combined experience, its mission is to acquire and reinvest in value-add, retail, and mixed-use properties. KPG targets underperforming, non-stabilized properties in New York City where it can generate value through capital improvements and strategic re-tenanting. KPG leverages its extensive network and market knowledge which supports a demonstrable history of unique, off-market deal sourcing. KPG provides long-term value to its partners and investors—both institutional and private. Additional information about KPG and a selection of current holdings and previous transactions are available at www.KPropertyGroup.com or by calling Gregory Kraut at 212-359-0743.